"This mouth watering banana cake is a favorite with kids. With its chocolate-nut topping, it's a nice alternative to banana bread." Preheat oven to 350 degrees F (175 degrees C). Grease and flour a 9x13 inch pan. Sift together the flour, baking powder and baking soda. Set aside. In a large bowl, cream the margarine and sugar until light and fluffy. Beat in the eggs one at a time, then stir in the vanilla and mashed bananas. Beat in the flour mixture alternately with the sour cream, mixing just until incorporated. Pour batter into prepared pan and sprinkle with topping. To make topping: in a small bowl, mix together chocolate chips, chopped peanuts and brown sugar. 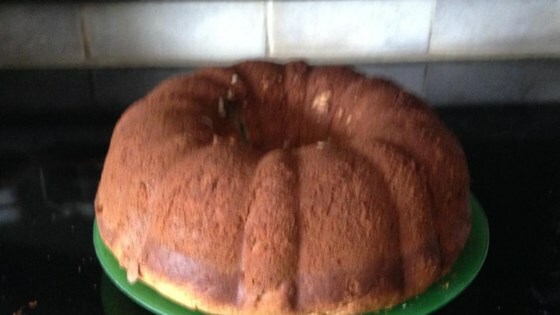 I made this cake but did not put the icing on it and I froze it for a month before I used it. The cake was moist and received rave reviews by my guest. You could not tell it had been frozen. The best banana cake I've ever had! We don't eat much cake in our house, but this one never goes to waste.